Measures 3.7m (146im) wide, 74 cm (29 in) tall – giving you flexibility and freedom of “safe space”. Simple to construct and install – panels can easily be locked into place – and with its compact design, it folds down for easy storage. When you’ve just had your baby, the last thing you’re probably thinking about is childproofing your home. It’s all about nappies, feeding, sleep times and settling. But very quickly your tiny tot gets a bit more active, and goes from lying contently on their tummy or sitting in their rocker, to moving and shuffling around the floor with a whole big new world to discover. Look out house – here I come!! When you look around your home you probably don’t see too many hazards, but look closer and you would be amazed how many potentially dangerous items are in their reach, how many rooms and cupboards they shouldn’t be in, stairs they can fall down, power points they can shove stuff in and things they can knock or tip over. Many first time parents don’t know what to look out for when it comes to childproofing the home, what advice can you give them? Right from the beginning invest in blind cord wind-ups. They keep blind cords out of the reach of babies in their cots and from older siblings in general. Over-long cords can be very hazardous. But remember to keep cots and beds away from windows and window fittings whenever possible. Once children become mobile, there are the obvious steps – block off power points with outlet plugs and move sharp objects, knives and poisons including medicines out of reach and watch out for the sharp corners on tables. Get down on all fours and look up at the world from the point of view of a crawling child. It’s amazing the hidden dangers you will immediately identify. What would you consider to be a potential safety hazard in and around the home? I don’t want to scare you but there are many hazards throughout the home. However with preparation, a lot can be improved on safety wise. Move regular medications usually kept in the bathroom or beside your bed up and out of reach of a child, and preferably locked away. 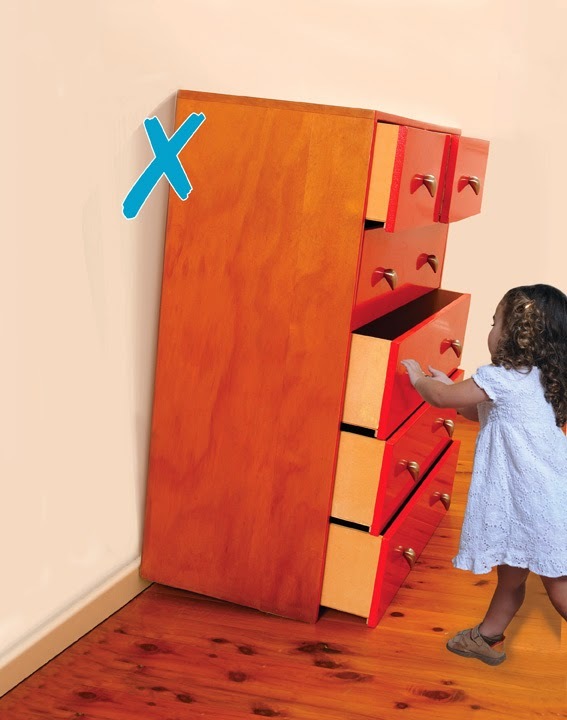 Keep children out of cabinets and drawers by properly securing them with child locks and latches. Prevent doors slamming on little fingers by securing them using a door stop or under door gripper. Preparation and recognizing the potential issues is what it’s all about. Remember though, every house is different, and every child is too. Your child may never even look twice at a cabinet, but what about that visiting cousin or friend? They may have other ideas so make sure your home is secured for all children not just your own. We need to look out for the obvious and the hidden dangers. Remember children learn and discover the world by experiencing things and unfortunately that can sometimes mean getting hold of a knife from the drawer, or unplugging the computer, or pulling on that tablecloth – so be aware at all times. Preparation, moving things out of reach, locking things away, keeping sharps and poisons out of reach, using a gate, keeping children within site, and only allowing your child to be supervised by a trustworthy and loving adult are all important precautions. Are there any toxins found naturally around the home that could be particularly threatening if a child came in contact with it? Plenty, including some plants in the garden and most household cleaners. Many people don’t realise that the residue left by everyday cleaning chemicals, particularly while still wet, can be quite bad. Likewise, the dishwasher drawer can be toxic even after the load is finished. Remember children or pets can touch this as they go about their day. Do pet doors pose a potential threat to small children? Yes! The doors come in different sizes and children can get stuck in them. Many pet doors can be locked so that nothing can pass through and if this is an option then do it! How can we secure windows without losing access and compromising on the aesthetic appeal? A lot of window locks are designed to blend with interiors now. Check our Dreambaby®’s Fold Down Sliding Door and Window Lock. Transparent and durable, this new Lock helps keep children safe by helping to secure most sliding doors (including those made from glass and an extensive range of other surfaces) as well as windows. Once installed the lock works by blocking any sliding action. While proving an enormous challenge for children, it is easily disengaged by adults for normal use when children are not around. This productive is adhesive which is also very attractive for those who rent. Other ideas include Dreambaby®’s special Aluminum Horizontal and Vertical Sliding Window lock especially designed to fit most aluminum horizontal and vertical windows. The Lock is made from metal (brass) for added strength and works with the use of an Allen key to tighten and secure the lock. Allen keys should be removed from the room after installation thereby adding an extra layer of security. Remember there is a range of window safety solutions that work both externally and internal so do your research. It’s very important to prevent accidental falls some of which can cause serious injury and even death. 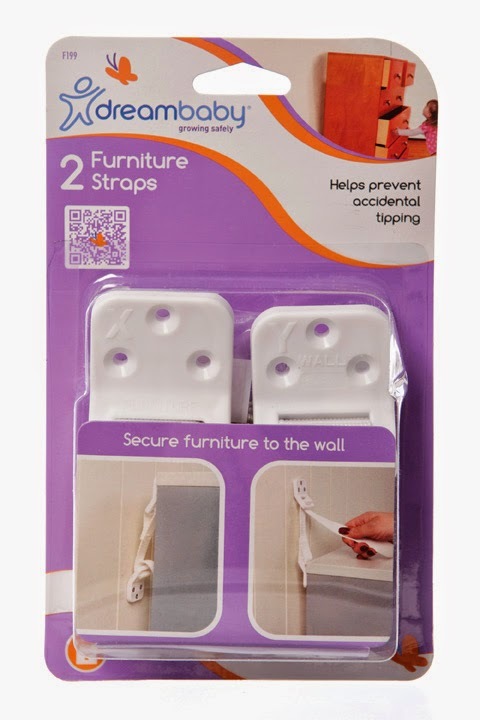 Do you create a range of designer safety clips that match decor? Dreambaby® has a range of traditionally colored white and black items that blend perfectly with white goods and a range of drawers. Other of our items are translucent and almost vanish into the background. We also have a ‘Style’ range, items that will blend into fashionable stainless steel appliances. If the lounge/ living room is the child’s play area do you recommend not having a coffee table at all? What is the most unsafe, hazardous home environment you have ever encountered? I have encountered lots of unsafe environments in my time. Laundries, kitchens and bathrooms are the areas to watch. Block them off with gates, and move everything sharp or poisonous out of reach, block off and lock cabinets and drawers that have things in them you do not want children accessing. DREAMBABY®’S RANGE OF FURNITURE ANCHORS AND TELEVISIONS STRAPS ARE EACH UNIQUELY DESIGNED TO PREVENT INJURIES TO CHILDREN IN AND AROUND YOUR HOME, BY ENSURING YOUR LIVING AREAS ARE KEPT SAFE! Television and furniture tipping is becoming an ever increasing problem, to almost epidemic proportions. In the western world, it has been stated that humans (particular little ones) are as likely to be killed by their own furniture as by terrorism! According to a 2013 study by the American Academy of Pediatrics, “The number of children injured by a TV tip-over has increased 125 percent between 1990 and 2011. Each year, more than 17,000 children are treated in hospitals for TV-related injuries. That’s one child every 30 minutes, and children ages five and younger are at the highest risk for injury”. Many of these accidents and injuries are minor – bruising, bumps and scrapes – they are also very are preventable. Sadly, the most alarming statistic of all is that, “once every three weeks in developed countries, a child is killed by a TV tip-over”. Dreambaby® Director recently commented: “As a child safety brand we are very aware of the many tragic accidents that can befall small children. Through constant research and collaboration between medical professionals and stakeholders in the area of world-wide child accident prevention, we work to support and develop safety solutions that directly relates to young families and the safety of their children. Our range of furniture safety tools is designed to work in with the real needs of parents from across the globe”. 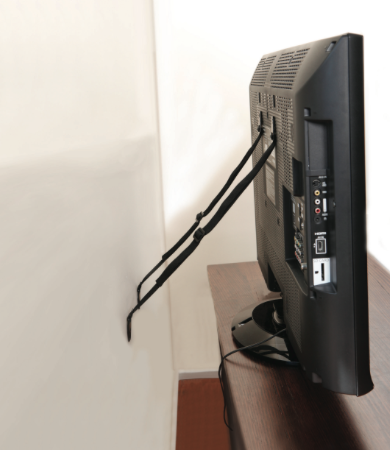 Dreambaby® Furniture Straps Easily to install, these heavy-duty straps help prevent flat screen TVs from dangerously tipping over onto unsuspecting young children. Attach the straps to the wall (all screws and bolts are included) or to the back of furniture they are resting on (as pictured), and remember to check the tautness of the straps from time to time to ensure their strength. 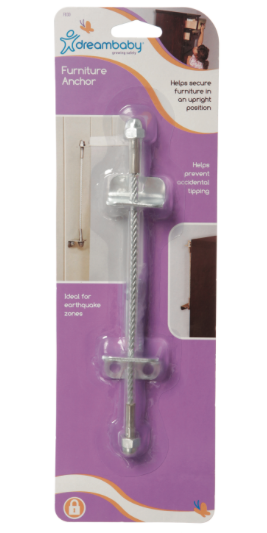 Dreambaby® Furniture Anchors are ideal for securing furniture such as bookcases, dressers and cabinets to the wall with a high-strength stainless steel attachments. They are very easy to install and are perfect for use in many rooms of your house, including all living areas. 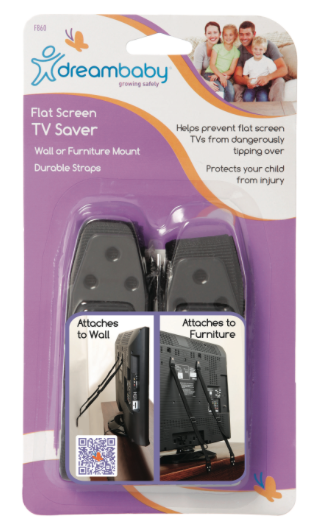 Dreambaby® Flat Screen TV Saver prevent potentially serious accidents by securing televisions to the wall or furniture with adjustable, heavy-duty straps. Again, these are easy to install and give parents and carers peace of mind when little ones are at home. These are easy to install and give peace of mind knowing that furniture is secure. They aren’t pretty to look at, but that isn’t the point. The instructions were very clear, I had no trouble with these, and I feel better knowing they are there. The anchor attachments are high-strength and stainless steel. I highly recommend these! Made by Renee receives products for review purposes, and may sometimes be compensated for posts. Posts may also contain affiliate links. All opinions expressed are solely from Made by Renee and were not influenced by any form of compensation. I was sent product to facilitate this review. All opinions are my own. DreamBaby has also supplied one for giveaway! When you have kids (of any age), you want to keep them safe. DreamBaby makes some wonderful products to help us with that. I was sent the Royal Converta 3-in-1 Play-Yard and Wide Barrier Gate after seeing that we have two little ones. We have small gates at the top and bottom of our stairs and one dividing our kitchen from the dining room. Warning: My house is a hot mess and this is a real post. I can’t show you real pictures of how we’re actually using the Royal Converta if I clean up my house and stage everything. I’m not one of those moms that keeps a neat house. It’s just not in me. Add a toddler and a baby, it just gets worse. What I like about this Royal Converta 3-in-1 is the size and versatility it gives us. Anyone with children of any age could use this. Actually, you really don’t even need children, it’d be great for dogs too! The entire length of this gate is 146” and it’s 29” tall. That’s the length of most rooms in our house, which makes it a great divider. We’re currently using our gate to divide our living room and dining room. Charlie loves playing with his marble game and other toys that consist of small pieces that we can’t just let him play with around his brother. With the gate, we’re able to set Charlie up in the dining room and keep Owen in the living room. Everyone’s happy! When you open the box, it’s practically ready to go. There are 6 panels, one of them being a door. You can easily move the panels around to position the door wherever you want. The kit contains brackets to mount the gate to the wall. As you can see, it’s plenty strong enough for Owen at almost 8 months to pull himself up on it and it doesn’t move. Tommy converted the long gate to the playpen in about 10 minutes and I’m sure next time it will be quicker! And did I mention that the whole thing folds flat for easy storage and travel? With small children, I worry about fingers being pinched and body parts getting shut in the door. The door for the Royal Converta 3-in-1 can open in either direction. Something else that I love is that it has a new Smart Stay-Open feature, so the gate does not auto-close. Charlie has a hard time leaving it open though and likes to play with it and close it. He can’t figure out how to open it yet though, which is really nice. I think it is really easy to open, making it convenient for busy parents running around the house or guests to use it. I hate going to someone’s house and staring at a gate like a ding-dong just wishing I could climb over it! With 12 feet of gate, imagine the possibilities! You can use this barrier gate to keep your fireplace out of reach for little ones, block off back doors to decks, or just loop it around as a play pen. DreamBaby has supplied one for a giveaway to a Mom’s Messy Miracles reader! Travel with Tots shared a link. Television and furniture tipping is becoming an ever-increasing problem to almost epidemic proportions. In the western world, it has been stated that humans (particularly little ones) are as likely to be killed by their own furniture as by terrorism! Dreambaby® Director Carolyn Ziegler recently commented: “As a child safety brand we are very aware of the many tragic accidents that can befall small children. Through constant research and collaboration between medical professionals and stakeholders in the area of worldwide child accident prevention, we work to support and develop safety solutions that directly help young families. Our range of furniture safety tools is designed to work in with the real needs of parents from across the globe by helping to keep their children safe,” commented Ziegler. 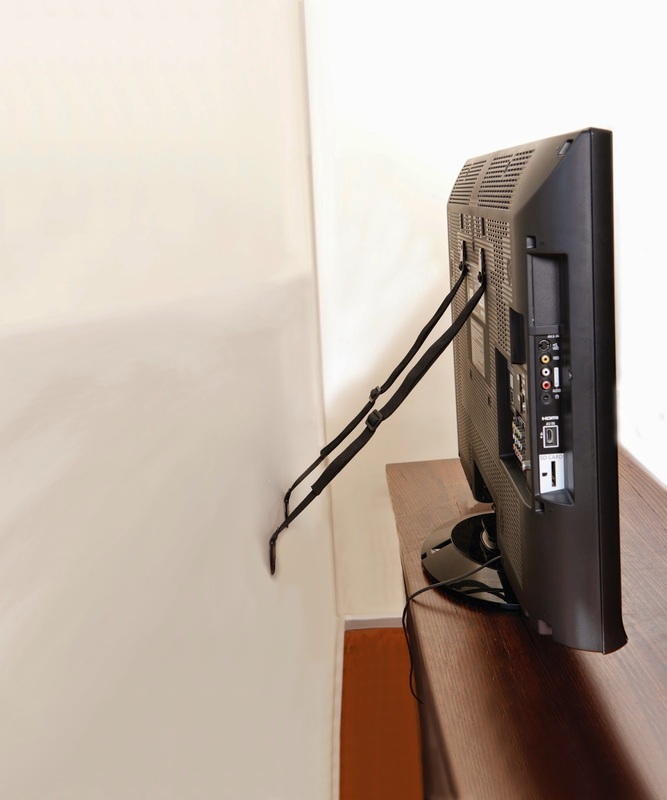 Dreambaby Flat Screen TV Saver prevent potentially serious accidents by securing flat screen televisions to the wall or to furniture with adjustable, durable metal fitting straps. Again, these are easy to install and give parents and carers peace of mind when little ones are at home. When I became a first time Mum with Hayley I think anymore stressing out and I would have become a grey mess! You worry about every little thing, and even some things you don’t even need to worry about- like checking every half hour during the night that baby is still breathing!! But soon Hayley learnt what those two things that kick around could do and found her legs. She then went to crawl all over the house getting into real mischief- you cannot take your eyes off them, even briefly. I was taping cardboard and thick blanket sections to corners of the table and every edge in the home.. If only I had come across Dreambaby® when Hayley was first born I would have been saved a heck load of stress and worrying. I have this attached to my bookshelf as I have always been scared that the bookshelf will come tumbling down on one of the girls if they were to climb on it to get something. I think the things on my bookshelf would be heavy enough to crush their poor little bones, and it is not a risk I am willing to take. If I had found these earlier I would probably still have that TV in the house now, but these straps work great to secure the TV down, and almost looks like a straight jacket for TV’s. I don’t need these now as since that one incident every single TV in the house is mounted on the wall! 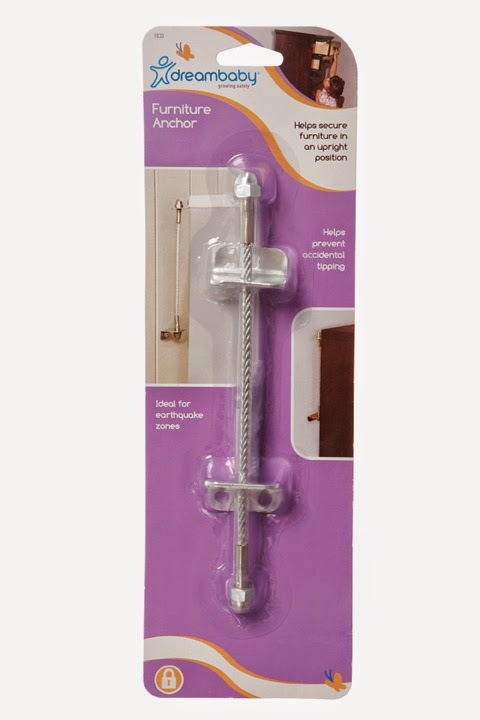 These are very similar to the Dreambaby®Furniture Anchor and you just tighten them up until your satisfied it is tight enough and not going to tip. I don’t know what would be better this or the anchor, but even their packaging say they do the same job. I have popped this one on our cube bookcase in the kitchen, which the floor isn’t even making the unit quite wobbly and that part of the house OUT OF BOUNDS! Now I don’t have to restrict the girls to certain rooms as they have all been made safe now. We now have a SAFE, FAMILY home. How would you like to keep your family home safe? 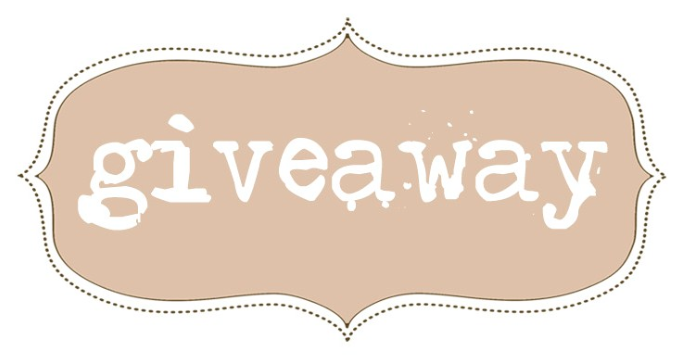 Dreambaby® and 3B’s have come together to be able to offer my viewers the same items as I have reviewed on the blog for giveaway.